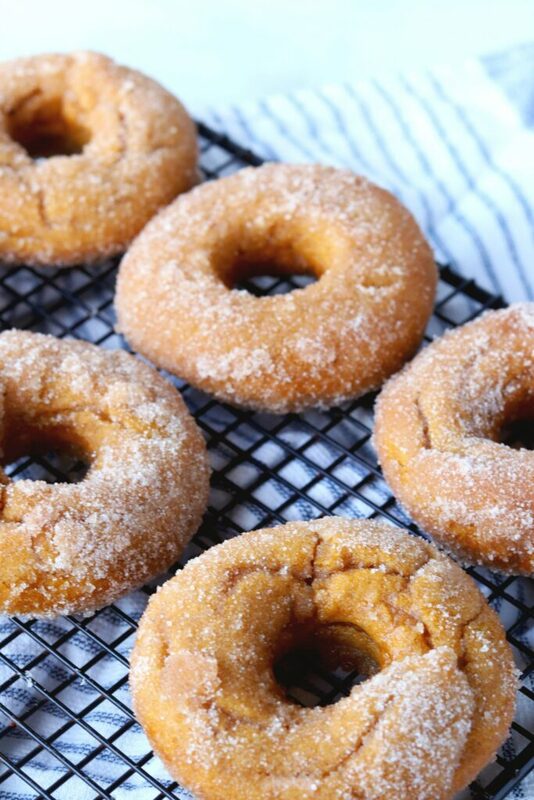 Irresistible, vegan pumpkin donuts covered in cinnamon sugar goodness! So good, you’ll want to make an extra batch! I’ve got a thing for donuts lately… chocolate, banana, carrot cake, glazed, galaxy, and pumpkin, just to name a few. In fact, once you realize how easy it is to bake your own vegan and gluten-free donuts at home, you’ll be wishing you tried making them sooner. 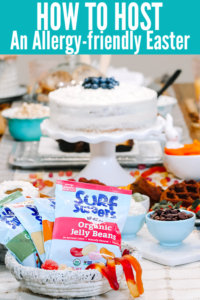 This summer, I partnered with a local juice company and brought in some of our favorite vegan + allergy-safe treats to sell on the weekends. The fun part for me was getting to see the excitement on the faces of those who bit into one of these baked goods for the first time. Can you image???? I mean, never being able to run into a donut shop or bakery to grab a donut or sweet dessert because you have a food allergy or restriction. I just loved being able to provide that for them. Due to their shape, all of the calories fall out the hole in the middle. Ok, maybe not entirely true on the last one, but it’s worth testing that theory. Which leads me back to our cinnamon sugar pumpkin donuts. 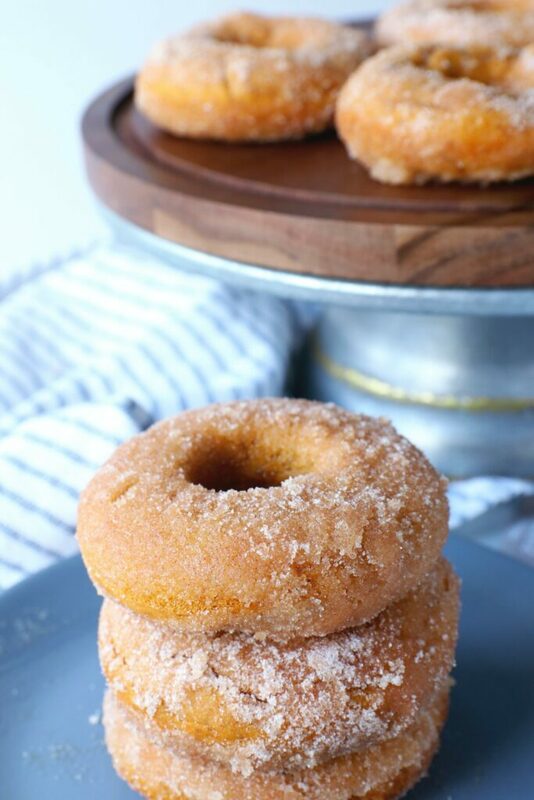 I kept playing with recipes, working on new flavors and in the process, tweaked my original Baked Pumpkin Donut to create this super light, perfectly spiced, fall inspired donut, covered in a coating of cinnamon sugar. Growing up, I would add globs of butter and a thick layer of cinnamon sugar to my toast. It was buttery and sweet and totally AMAZING! 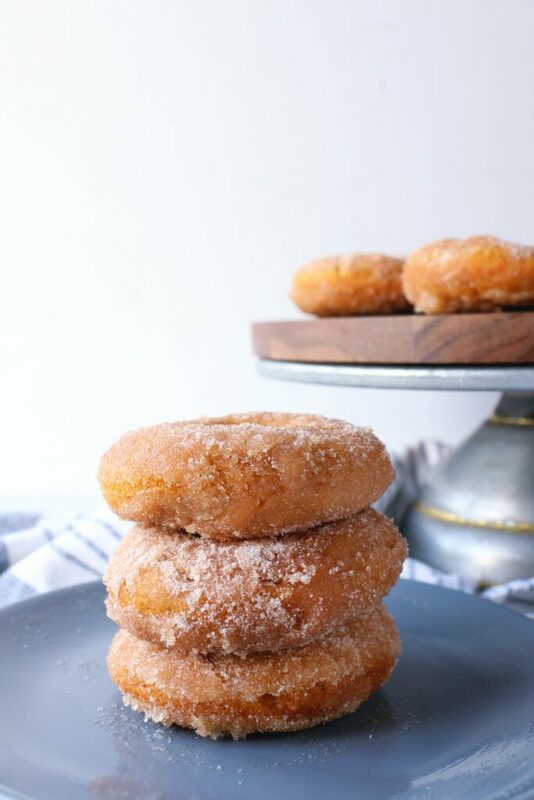 However, as an adult, it’s no longer acceptable to eat cinnamon sugar toast, but no one will shame you for eating donuts rolled in a coating of cinnamon sugar! On the contrary, they will be jealous! And want the recipe! Especially when they hear that pumpkin is involved. And even better, if you’re trying to cut back on sugars, then use Allulose like we did. It’s a low calorie natural sweetener that is great for Ketogenic, Vegan and Paleo diets. 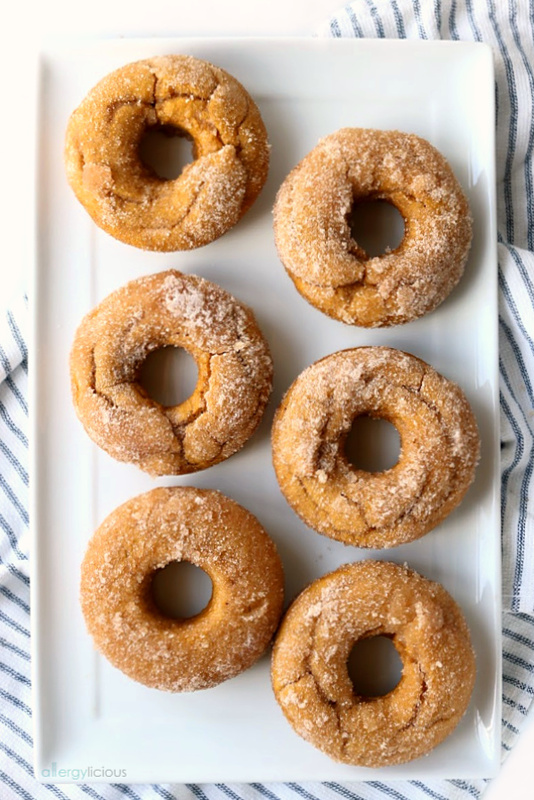 These vegan cinnamon sugar pumpkin donuts were everything I had hoped for them to be and more. When they are still warm they practically melt in your mouth. They also keep pretty well in an airtight container…but nothing beats fresh, hot donuts. If you make this recipe, be sure to snap a picture and share it on Instagram with #allergylicious so we can all see! 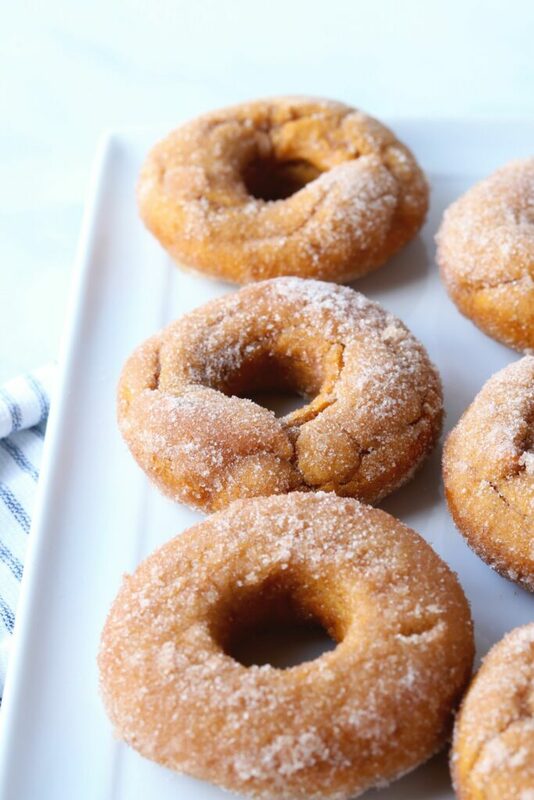 Irresistible, vegan pumpkin donuts muffins covered in cinnamon sugar goodness! So good, you’ll want to make an extra batch! Gluten-free and Nut-free too. Preheat oven to 350°. Lightly spray or grease donut pans to prevent sticking. In a small bow, whisk wet ingredients: coconut milk, pumpkin puree, oil, vinegar and vanilla until smooth. Pour wet ingredients into dry ingredients and stir together ( or use a handheld mixer ) until combined. Add batter to a pastry bag or ziplock bag, cut corner then pipe into prepared donut pan. Bake 10-12 minutes or until they spring back slightly when touched. Cool in pan for 5 minutes then carefully remove. In a meantime, prepare cinnamon sugar mix. Mix together sugar and cinnamon in bowl and set aside (or place in a large ziplock bag). Take the warm donuts and dip the donuts into the cinnamon mixture to coat. You can also add to the ziplock, shake and remove. **I found that the warm donuts were moist enough for the topping to stick. But if you want extra sugar, dip in butter before coating with cinnamon sugar mix. Have you ever made your own donuts? Do you have a favorite flavor or topping? If I could make one donut for you, what would it be? Be sure to comment below! Want to know more about Allulose? Visit their Website, Find them on Facebook or Instagram and you can purchase it here Keystone Pantry Allulose online . These look incredible! I need to get a donut pan so I can make them! Girllllll! Made these this morning and LOVED them! They are all gone! Kids devoured them when they got home from school. Will definitely be making these again! Love hearing that Jenn! Thanks for sharing and so glad the kids loved them too. Kortney, that’s awesome that you still do cinnamon toast….I can get away with it eating it when you introduce it to the kids. I just made these and they were . The flavor was okay but the texture was dense. I think it’s the flour is use. It’s Ryze and I get it on Amazon. It only has rice flour as the ingredient. Do you think that’s the issue? I feel like they needed to be more fluffy. Also the color was brown and not light like yours. I’m really trying but baking is so hard for me! I appreciate your input. I don’t typically use Ryze but when I’ve used rice flour on its own, I do find the texture to be grainy and just a little off from how it should be. As far as how light they are, did you use dark brown sugar by any chance? I tried them again with cup4cup GF flour and I added little more pumpkin. They were delicious!! Thanks for the recipes. 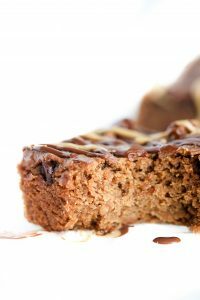 I made the Magic Bars and they were yummy too! Next up is the Twix Bars. Can’t wait to try them. I really need to try Cup4Cup again…I just never success using it. But so glad it’s working for you in these recipes from the blog!!! Thanks for sharing. Nicole, you are just the sweetest soul. And Yum! I honestly thought those donuts were fried, they look so perfectly tender. Do I need to add xanthan gum if my gf flour doesn’t contain it and if so how much please? Yes, you do need to add Xanthan gum. For every cup of flour, use 1 teaspoon of it. Is the sugar mix really just 1/2 tsp of sugar? That doesn’t seem like enough. Thanks! You’re so right, it wouldn’t be enough! The recipe now reflects 1/2 cup of each…thank you! 1/2 CUP of ground cinnamon seems like not right.. making it now.. assume 1/2 teaspoon? Yes, that would be a lot. It was edited but never updated…thank you for letting me know. It’s now been corrected. I want to try making these in an air fryer!! Do you think it’d work? I’ve never made donuts in my air fryer. Most of the recipes I’ve seen is for a yeast based donut, which these are not. Feel free to experiment though and let me know! Oh goodness, those Hurt’s Donuts look amazing but I’ve never had one, so thankfully I don’t know what I’m missing 🙂 You’ll have to give this one a try and just to make it more “hurts-like”, maybe coat the icing with something like Van’s cinnamon swirl graham cereal. YUM. Hi, could coconut flour be used? If so do you know how much? Thks! I honestly wouldn’t use an equal amount of coconut flour for the gf blend, just because it is more dense. I’d start by subbing 1/4 cup of GF for coconut flour and go from there. Hi! I have two questions. 1: do you think these would work as muffins or anything else? I don’t own a donut pan. Also, this seems like a lot of sugar (for me personally). Do you think I can sub it for anything else or potentially just cut the amount down and not replace it?? 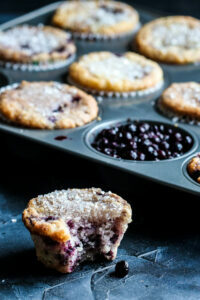 I haven’t tried a muffin tin but I would think it’s worth trying, just monitor the baking time (increase it to 15-18min). As for the sugar, you won’t use all of that when it comes to the topping, but you want your bowl full enough. And the recipe, you can always cut back a little but I tried cutting it back as much as possible without affecting the taste. Let me know what you end up doing and how it turns out. I want to make these for my grandson. GF baking is a challenge for me to learn. Can you specify what size donut pan you use? I can’t tell by the pictures if it is regular or mini donut size. Also, I have never made donuts before. How much do you pipe into each space? Hi Kelly, I’m so glad you’re making these for your grandson. I used a regular sized donut pan but if only have a mini pan, then reduce the time to 7-10 min. Just check as you normally would for doneness, since not all ovens are accurate. As for piping, I fill it about 2/3 full. That gives it a nice round top without getting too large on one side. Hope that helps and can’t wait to see or hear how he likes them. Thanks so much for your quick response! I took your advice and filled about 2/3 full, (kind of difficult to guess, the batter was really thick), and baked for 7 minutes. It made 24 miniature donuts. They are delicious! I am excited for my little guy to try them tomorrow. I made these with regular flour and regular milk since my son is only PN, TN, and egg. They were awesome! He really liked them. Thank you! That’s great and I’m so glad he liked these donuts. I try to create recipes that are adjustable for each persons diet, so I’m happy you could use the ingredients you are use to.